Nothing makes a great Summer get-together like the perfect party food. We've partnered with RITZ to share easy no-bake recipes that pack an impressive punch. For fool-proof appetizers to serve during that in-between time when everyone's craving a filling snack, let cream cheese pinwheels be your go-to. 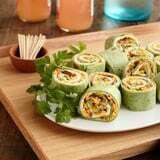 Made with savory, flavorful ingredients in colorful spinach wraps, we know your guests will be reaching for these. Slice green onion and crumble bacon. Set aside. Spread cream cheese evenly on all 4 tortillas and top with dijon mustard. Layer bacon, green onion, and cheese on each tortilla, leaving a half inch at the end. Add ground pepper to taste. Cut into 1 1/2-inch strips and roll to create a pinwheel.